Intermodal transportation involves using two or more forms of transportation in a journey. 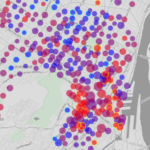 Bicycles can often increase ridership of public transit. 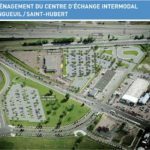 However, limited storage space onboard hinders the promotion of intermodal commutes. 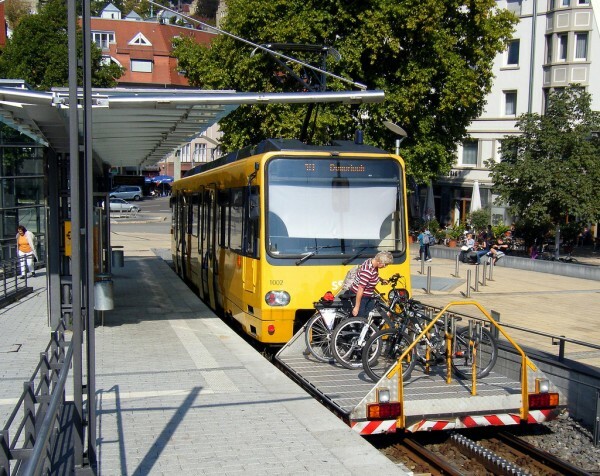 This innovative solution from Stuttgart, Germany adds desperately needed bicycle accommodation on this light rail line. Sure this is looks like an interesting solution, a bike rack on the move. Bicycles can help bridge the last mile (or two), between the transit stop and the home, and make commutes much more pleasant that way. But it immediately raises some questions. 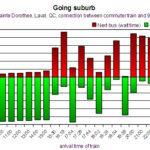 If people can get on and off with their bicycles, doesn’t that increase the dwell time and slow down the train a lot? If the vehicle operators observes the bike rack in front of them, what happens when the train goes the other way? This appears to be a terminus, and there’s no loop in sight. Also, doesn’t the rack appear a bit small, how useful could it be? To answer these questions, one has to look at the actual transit line in question. The line in the picture is actually the “Zahnradbahn Stuttgart” (Stuttgart Rack Railway, the German Wikipedia article is much more informative). A rack railway, or cog railway, is a railway that uses a toothed rail, which can be seen in the picture running between the rails, to be able to climb steep grades. Normal rails can only be operated at grades up to 7~10% for trams, and up to around 4% for electrified main lines. This line has a maximum grade of 17.8%. The Stuttgart Rack Railway is one of only four cog railways still operating in Germany, and the only one that is integrated into a transit system (i.e. not a tourist line). It started operating in 1884, and it’s really short. Along its 2.2km length there are 9 stations, it’s single track except for a passing station in the center, service is provided every 15 minutes. 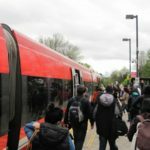 In its operation it is remarkably similar to the Ottawa O-train, a short single track line with a passing station in the center, and two trains shuttling back and forth every 15 minutes – except it has about the quarter of the length. Given the short length of the line, it would seem like a line with not a lot of utility. Why wait fifteen minutes, if you can just walk the whole length of the line in that time? And it could be biked even faster! But the key to its utility is that it is a cog railway — along its short length, it climbs 200m in altitude. That’s quite a schlepp, and if you add a bicycle to the mix, the utility of the bike rack reveals itself – the bike rack is only used in the uphill direction, and only from terminus to terminus. This way there are no delays due to bikes when the train is running, and the driver can always observe all the bikes, and make sure none are falling off etc. 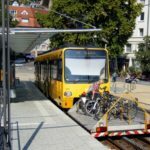 The Stuttgart Cog Railway is thus not a system that solve the last mile problem – it’s barely more than a mile long. Instead, it is more like an urban elevator and solves the problem that walking and riding in hilly areas can be a pain. With the snow storm hitting the North-East, and thousands of flights cancelled, I’m reminded of this ad from 1966. It’s for the Deutsche Bahn, the rail operator in (West) Germany at the time. 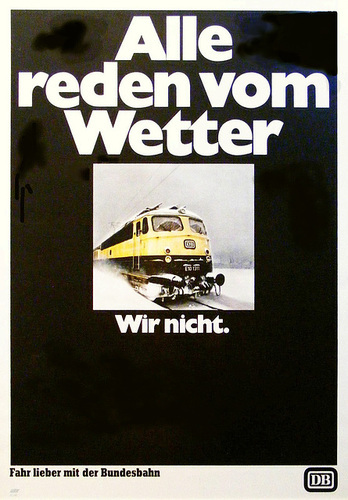 It says “Everybody is talking about the Weather … not us”, and at the bottom, “just rather take the train, DB”. Yes, the train does not rely on airports or cleared highways to run, and is at least in theory not disturbed by snow, low lying clowds, or vulcanic ash clouds. Often stranded due to weather, I have wished for a rail connection to where I wanted to go, not having to rely on airlines. Of course this above ad seems optimistic nowadays, with the now semi-privatized ‘Die Bahn’ not being prepared for the winter as much as it used to, or when several Eurostar trains got stuck in the Channel Tunnel in 2009 due to “the wrong type of snow“. 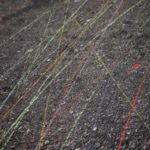 On the other hand, on that particular day, I was actually flying to Europe via London, had flights cancelled, and ended up stranded overnight on the Amsterdam airport – so I did not do much better than the people stuck in those trains.